The much rumored Iconia W3 comes with a 1280 x 800 pixel resolution and an Intel Atom Z2760 Clover View processor. Acer's Iconia W3 has made a few unofficial appearance courtesy of their Finnish website and Amazon, and we now have official confirmation of the device. 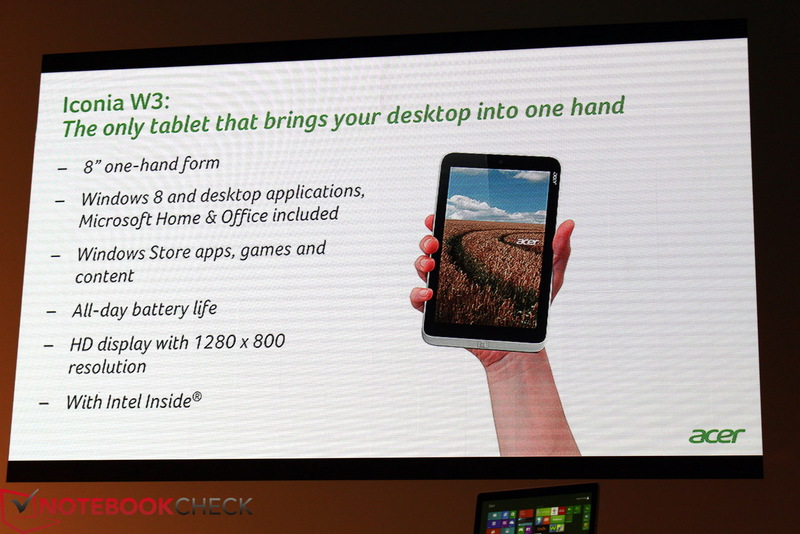 Unveiled here at Computex 2013 in Taipei, the 8.1" tablet is powered by an Intel Atom Z2760 CPU and Windows 8. The actual hardware on the W3 is similar to what had been previously rumored, including a WXGA touchscreen with a resolution of 1280 x 800 pixels, and PowerVR SGX 545 graphics as part of the Clover Trail processor. 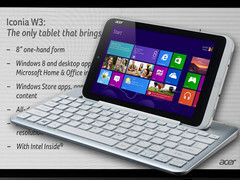 The device is also the smallest Windows 8 tablet out there, and features a pair of cameras, micro-USB and micro-HDMI. The W3 will be available in 32GB and 64GB versions as of this month, with a starting tag of 330 euros and 379 euros respectively. Acer is also making a Bluetooth keyboard dock available for an extra 70 euros, although it is larger than the tablet itself, making for an awkward arrangement. The new tablet is powered by an Intel Atom Z2760 mobile-optimized processor to smoothly handle a range of apps, including web browsing and enjoying digital media. Plus, the Acer Iconia W3 provides up to 8 hours of battery life(2) to boost all-day productivity in classes, while traveling, or simply for staying in touch throughout the day. Connected Standby helps extend battery life by turning the display off while the device remains powered on to handle background tasks. 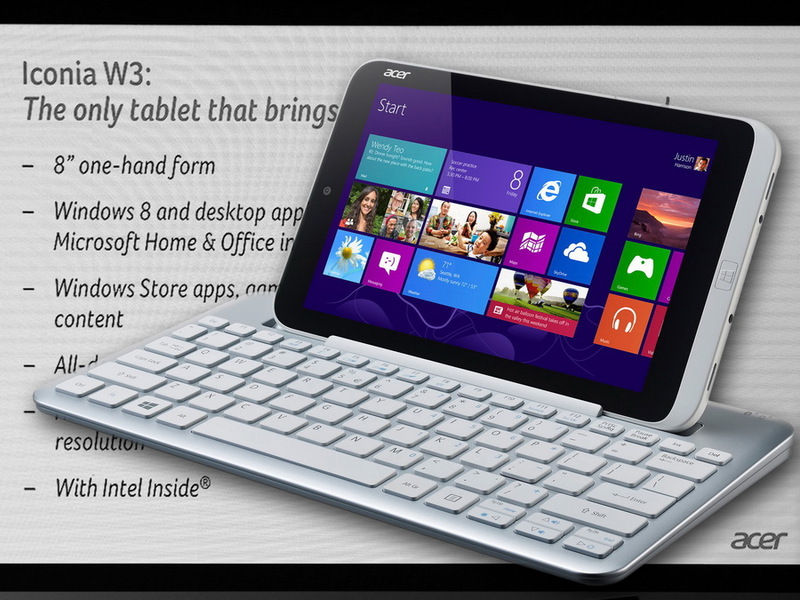 The Acer Iconia W3 keeps consumers connected to Wi-Fi networks and hotspots with 802.11b/g/nwireless technology. The Iconia W3 with 32GB and 64GB capacities will be available in June from retailers starting at a Manufacturer's Suggested Retail Price of €329.- and €379.-. (4) The optional keyboard will be available for a price of €69.- and the case will be available for €24.90.- (grey) and €27.90 (white).